CBC Daybreak North Celebrates 30 Years! Posted on November 27, 2018 in What's New!. It’s not often I think back to my decade as a radio news reporter in Northern BC prior to starting my public relations career, after all it’s been over 25 years since I hung up ‘the microphone’, but on Friday, November 23, 2018 all that changed. I was the special guest of CBC Daybreak North (Northern BC’s CBC Morning Show) and I got to sit in the studio and watch the entire program! Three times during the program Host Carolina de Ryk and I talked about the early days of Daybreak North and my involvement with the initiative. To listen to the full 30th Anniversary Episode, click here. I started my radio news career in April 1983 with CJCI Radio in Prince George (now Vista Radio). I moved to CBC Radio News in September 1984. CBC at that time was centered in Vancouver and Prince Rupert and only occasionally would CBC reporters travel to the Interior and North to cover stories. That changed in late 1986 when the CBC leadership decided it was time to provide full radio service coverage to all of BC. As the first step in the process, I was dispatched to Prince George in February 1987 to set-up a bare-bones News Bureau and start filing stories to the Prince Rupert, Vancouver and occasionally Toronto (National stories). Between March of 1987 and April 1988, CBC Prince George was housed in the 2ndbedroom of our two-bedroom apartment! After a year of having CBC as our house guest, I received the good news that a permanent CBC Bureau would be established in a small storefront office in downtown Prince George. CBC also decided at that time to locate permanent staff in Kelowna, Kamloops and Nelson. In April 1988, I moved CBC Radio News in Prince George from our apartment to our new office on 5th Avenue and through the Spring and Summer I was joined by staff who would launch the new Northern BC Morning Show (Daybreak North) on November 24, 1988. A small team of CBC staff remained in Prince Rupert and they also contributed stories to the program. The move allowed CBC to provide broader coverage of key stories from all regions of Northern BC and Daybreak North has been a fixture in many Northerners lives ever since! I worked alongside the Daybreak North team as the radio news reporter until March of 1991 when I got an opportunity to work in the CBC Vancouver Radio Newsroom. My family and I enjoyed a wonderful spring and summer in Vancouver but with a young daughter and our son on the way and Vancouver housing prices already through the roof, we decided to move back to Prince George and returned in time to enjoy a snowy, cold Halloween. Two years later on Halloween 1993, I hung up the news reporter microphone for the final time and started in public relations the following day. 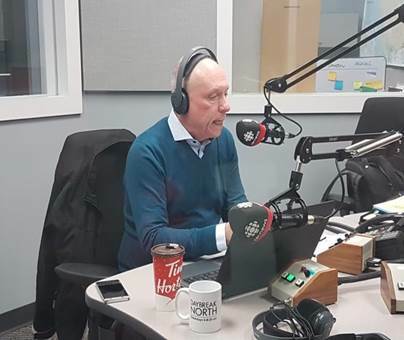 Thank-you CBC Daybreak North for the opportunity to walk down ‘Memory Lane’ and relive my 9 years as a radio news reporter with Canada’s national broadcaster. My cool new Daybreak North coffee mug will serve to remind me of the opportunity for years to come.